Here’s my overall one-size-fits-most, best approach to locating a publisher that’s a terrific match for you and your project, if 1) You’re not self-publishing, or 2) Your book is not a likely candidate for one of the big New York publishing houses (meaning an agent is far less likely to take it on). Among the remaining 10,000 small- to mid-sized publishers, or remaining 80,000 micro-publishers in the U.S., there may be a handful of houses ready to make you an offer. – Spend a few hours on Amazon researching existing books on your topic and any topic, really, that is aimed at your book’s likely audience. Take in all you can about these titles—such things as sales rankings, reviews (what do readers like about the books? dislike? want more or less of? what do they care about? what are their hot buttons? ), their packaging and marketing (what can you infer about how they’re titled, designed, and promoted? ), and what related books customers also purchased. Finally, you want to know…which firms are publishing those books? Start making a list. – Visit the biggest bookseller near you and see which companies are publishing books on your topic and closely-related topics. Add to your list of publishers. Which ones have an approach, style, design, vibe, etc. that you like, and that would be a good fit for your book and its intended audience? Where Amazon can give you breadth, depth, and near-instant information, there is also much to be gleaned from holding physical books, and assessing their properties and the decision-making that went into them. – When narrowing down your list of potential publishers for your book, aim to have at least 50 to 100. Seriously. Consider any press that might be a match: micro, small, independent, niche, regional, academic, nonprofit, organizational, religious. – There are various other directories and listings of publishers online, but in my experience, they are mostly redundant (if you’ve done the above steps) and/or heavy on teeny-tiny, out-of-business, and scamming operations. – Visit the websites of companies on your list and spend time getting a sense of who they are. – While on those websites, read the company’s submission guidelines. Nearly 100% of publishers’ websites now contain this information and you usually don’t have to dig around too much for it either. If you discover your book is not a good fit for them, remove them from your list, and move on. – As you go, prioritize your list of potential publishers based on a combination of your book’s right fit for them, and their desirability for you. 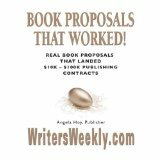 – Next, submit your book proposal package per the instructions (to a tee) on their websites to the publishers on your list, starting at the top and working down. (Think big from the start…don’t “work up” to them!) Simultaneous submissions are okay unless stated otherwise. Divide up the work as it makes sense to you, but I’d advise sending them out in batches of 2 to 10 each day in a steady stream until you either reach the end, or have a contract. Commit to the project and concentrate your efforts. Don’t drag it out. Publishing takes a long time to respond! You either want to find a publisher in a reasonable amount of time, or move on to considering self-publishing or hybrid options. – If a publisher’s submission guidelines aren’t specific, think of a book proposal as a “business plan” for your book, and a publishing contract as a “business agreement” between you and the publisher, and it will be hard to go wrong. – Unless the submission guidelines prohibit it (or politely request not to do it), plan to check in with every publisher you’ve contacted, but not heard back from, 30 to 45 days after your initial contact. – Use every aspect of your initial contact(s) with a publisher to show your professionalism, your attention to detail, your work ethic, your understanding of their business, and their point of view. All other things being equal, they’ll almost always choose the author who’s more professional, and easier to work with. – If anyone takes the time to jot you a few notes about your book (with their rejection), see what you can learn from the experience, and take steps to use that knowledge to your benefit. Tweak future submissions as necessary. – Don’t give up. Periodically review your proposal with fresh eyes, and upgrade it as necessary. Get advice from others (preferably those with some knowledge of the process). Keep sending it out. Keep your brain trained on new ways to pitch your book, on new opportunities to get it published, and on ways to improve your book in the meantime. – Create and know your contingency plan. Build your schedule around it. How long will you devote to finding a publisher? If you don’t find a publisher in that amount of time, will or won’t you pursue self-publishing? What self-publishing options are out there, how and when will you learn about them, and how will you assess them? Both of these numbers now include some amount of hybrid publishers. This is an excerpt from the forthcoming workbook, Pitch What’s True: Use a Publisher’s Tools for a Winning Outcome for Your Nonfiction Book (Fall 2018). Sharon Woodhouse is a book publisher (www.everythinggoesmedia.com), publishing consultant, author, and small business coach (www.conspirecreative.com). Her latest book is The Coach Within: 28 Big Ideas for Engaging the Power of Your Own Wisdom, Creativity, and Choices. One Response to "Find the Right Publisher for Your Non-Fiction Book – by Sharon Woodhouse"